After Thanksgiving, my family and I usually gather in the kitchen to bake up a large batch of biscochos. It's a lovely segue into the Christmas season, baking dozens upon dozens of spicy cookies to give as gifts for family and friends (and to keep for ourselves). Since the process takes a few hours, we like to make mugs of hot cocoa and play Christmas music. Hot cocoa, to me, signifies the transition from fall to winter, and makes me feel all warm and nostalgic. 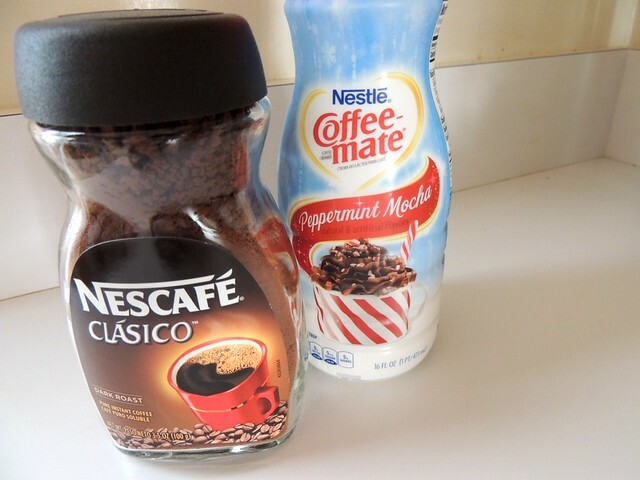 When I got the news that I'd be trying Nescafe Clasico and Coffee-Mate Peppermint Mocha creamer, I knew I wanted to incorporate the two of them into a cup of hot cocoa. 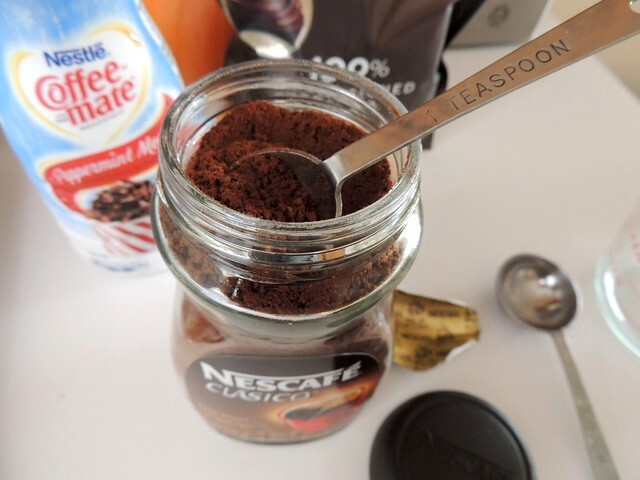 I typically keep instant espresso powder on hand for baking and occasionally adding to beverages, though I've also used instant coffee packets. 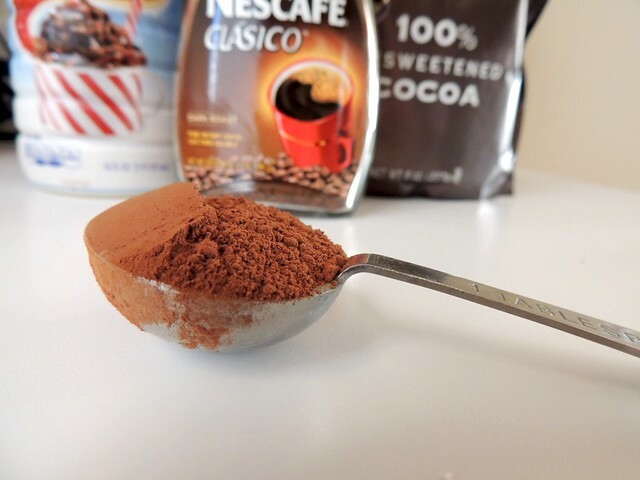 The Nescafe Clasico instant coffee powder doesn't smell as overpoweringly strong as store brands I've tried, so I figured it wouldn't taste too harsh in the hot cocoa, but rather would compliment the cocoa and the mocha flavors in the Coffee-Mate Peppermint Mocha creamer. It wasn't too granular, either, making it easy to dissolve in hot liquids. 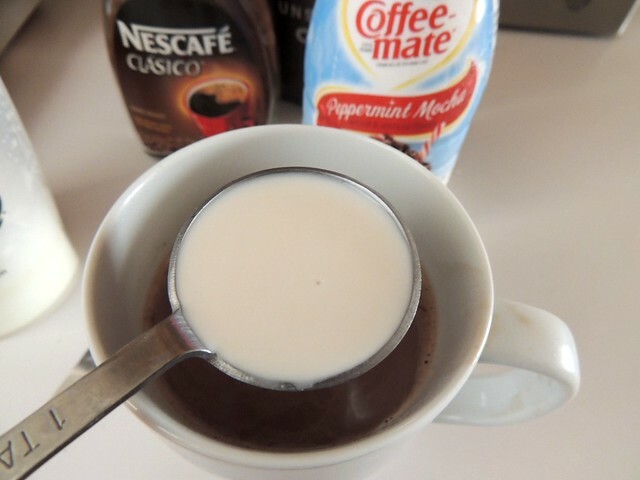 Coffee-Mate liquid creamers are my favorite, especially the natural liquid creamers. But for today, I purchased the Peppermint Mocha flavor, a perfect holiday flavor. It's a lot easier to add a tablespoon of this to my cocoa than it is waiting for a candy cane to melt! I tasted a little bit on its own and it has a pleasing peppermint flavor with a mocha (chocolate-coffee) after note. It's neither too strong, nor too artificial of a taste. I might even add a little drop to my morning espressos! While it's not very sweet, I reduce the sugar I add to compensate. Back to the hot cocoa! I had initially meant to make a batch of instant hot cocoa mix, something my mom would make every year for the winter months, but I forgot the powdered milk. Not one to let forgotten ingredients stand in my way, I resorted to an easy hot cocoa recipe I found from Allrecipes.com. I scaled it down from 4 servings to 1 using their nifty "adjust recipe" feature. 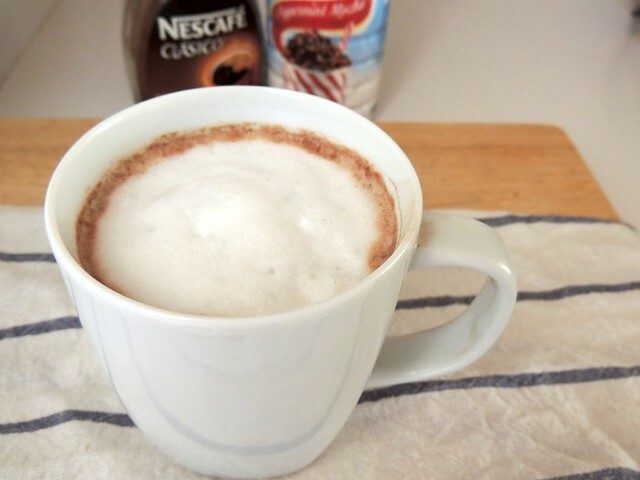 For one cup of hot cocoa, you will need cocoa powder (use the best you can find! 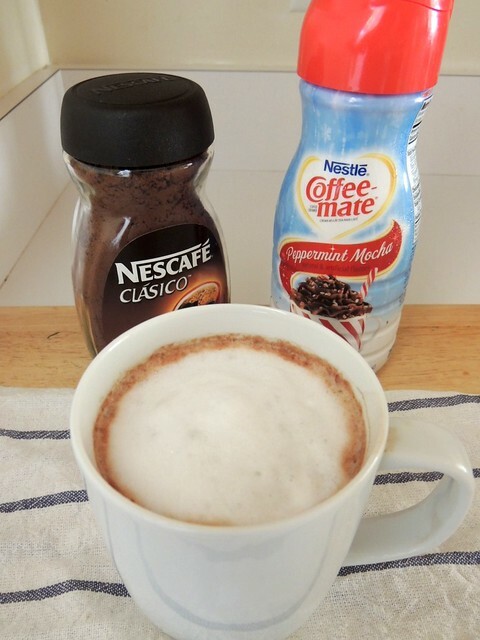 ), instant coffee (obviously, I used Nescafe Clasico), granulated sugar, and a pinch of salt. 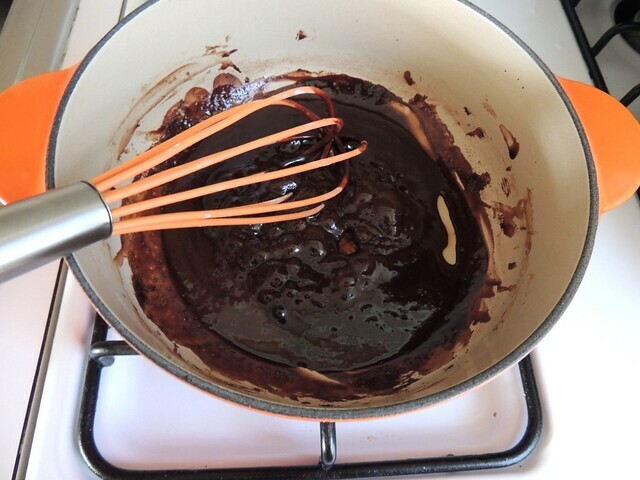 The cocoa powder and instant coffee slurry is then brought to a very gentle boil and cooked for two minutes in a small pot. This helps the cocoa powder and coffee granules "bloom", releasing their flavors. 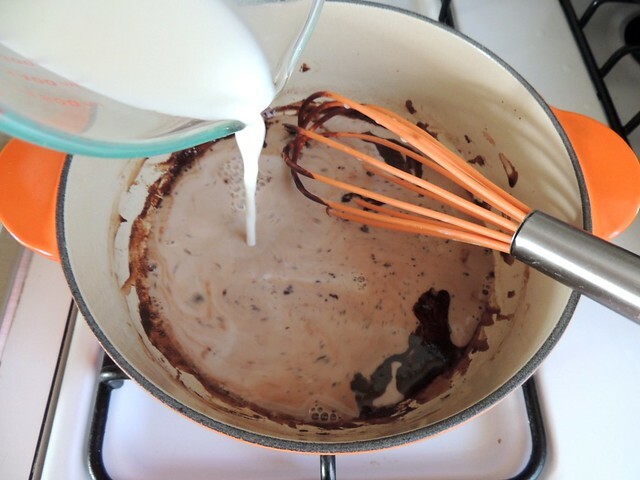 Milk is poured in while whisking to incorporate. It'll take a little bit of whisking for the two to be completely combined. Then, the hot cocoa is heated for another two minutes, or just until the milk is hot. 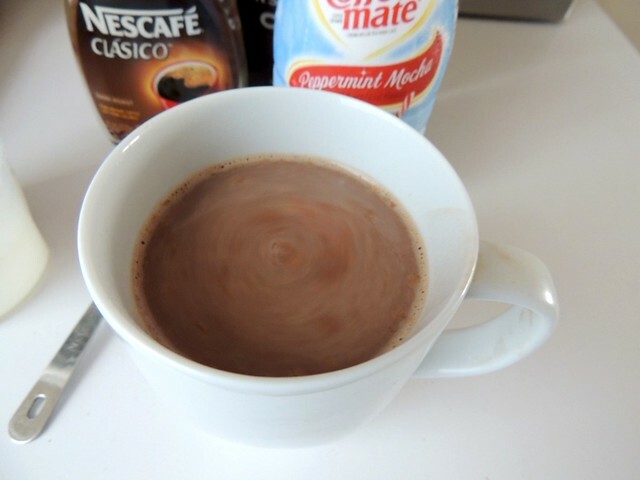 In place of the half & half the recipe says to add at the end, producing a creamy cup of hot cocoa, I substituted a tablespoon of Coffee-Mate Peppermint Mocha liquid creamer. Adding it at the end brings the hot cocoa down to a suitable drinking temperature, according to the recipe. I topped my hot cocoa with milk foam, though whipped cream would be a good choice, too. Hopefully when I go back home in a few weeks to visit, we can bake some biscochos and sip hot cocoa! 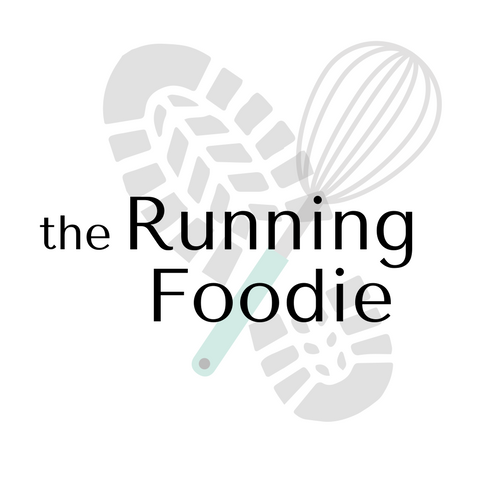 If you've made it this far, please click on over to Facebook to vote for my chocolate chip cookies in the Fonseca BIN 27 #CookieRumble contest! If the link doesn't work, look for the chocolate chip cookies by Christine in Fair Lawn. Click This Link to Vote! You never said how much mixture of each.